In the week ahead of the game, a Clitheroe man was in court after killing a two-year-old toddler in Bivel Street in Burnley. He was charged with careless driving and the court heard he was driving at a speed of at least 46 miles per hour in a 30 miles per hour area. The court was also told that had he been driving within the speed limit at the time then he would have been able to stop in time, thus preventing the accident. The man was fined £150 with £20 costs. He was also given points on his licence that, with the totting up process, brought him a six month ban with the court ordering that he should re-take his driving test before being allowed his licence back. Road issues were grabbing the headlines and finally there was to be action on Brunshaw Road at its junctions with Brownhill Avenue and Brunshaw Avenue. It had come via a promise from the Chief Constable of Lancashire, Brian Johnson. Just a few weeks ago we reported that a petition had been set up. Over 600 signed the petition and it was handed to Mr Johnson by County Councillor Mrs Joan Keene at a meeting of Lancashire's Police Committee. Mrs Keene pointed out the dangers to children and elderly people in the area, which has five junctions within 200 yards and serves three bus routes. The committee accepted the petition and agreed that the situation should be looked at with some urgency, a decision that was greeted with delight by Mrs Marion Smith who had organised the petition along with Councillor Arthur Park. The traffic problems in town weren't easing as work continued to extend the pedestrian area. One dismayed resident penned a letter to the Burnley Express and wrote: "Following the recent traffic re-arrangements in Burnley Town Centre it is apparent that the borough council, encouraged by its officers, will finally achieve their objective, conceived in the 1960s, of killing off the small to medium town centre shops which used to provide much of the character of the town and which used to provide the type of service unknown to the large chain stores." He also made reference to the sad departure of buildings such as the Market Hall, the Victoria and Palace theatres and the Yorkshire and Empress Hotels, and ended: "I hope that the latest fiasco will result in the public outcry that it deserves and that pressure will ultimately be placed on the council to admit that the policy is based on half-baked and outdated theories which ought to be abandoned before any more damage is done." Just before Christmas it was reported that a house had blown up in Burnley Wood leaving a young couple and their dogs homeless. The man of the house was then arrested and the 27-year-old appeared in court charged with stealing an unknown quantity of gas and destroying property in Parkinson Street, being reckless as to whether life, including that of his wife, would be endangered. The prosecutor in court, Mr David Macro, confirmed that the amount of gas stolen was very small, but that it resulted in a leak and explosion which was very serious and life threatening. The accused was granted unconditional bail. A Preston man appeared in the Burnley courts following a complaint during the summer from a resident who had gone to Kwik Save in Burnley to buy chicken from the butchery concession. When an environmental health officer attended she found two pieces of chicken with a foul (not fowl) smell and another piece turning green. And so it was the concession owner in front of the Burnley courts. His solicitor told the court: "He's deeply disturbed and upset by what's occurred, and very upset with the manager for keeping it a secret from him." He pleaded guilty to an offence of offering for sale chicken pieces which were unfit for human consumption. He was fined £500 with £200 costs. There was better news at another Burnley store with Ruth Morgan from the cosmetics counter at Boots nominated for the company's 'Consultant of the Year'. Ms Morgan had already benefited hugely with the presentation of a £10 Boots Gift Voucher but, should she become Miss Boots Consultant 1992 she could enjoy a £500 holiday voucher and a trophy. As Burnley prepared for the home game against Gillingham, hoping to get back to winning ways after the 5-2 defeat at Blackpool, manager Jimmy Mullen took time to speak out at the treatment he'd received from the Blackpool supporters at Bloomfield Road. "I'm very, very disappointed with the so-called supporters of Blackpool Football Club," he said. "I was absolutely gutted by the personal abuse aimed at my staff, my players, myself, my wife, my directors and their wives by the supporters of a club of the standing of Blackpool. "A club like Blackpool must be concerned about the way we were treated, I think it was disgraceful. "I was the manager of Blackpool and I am the first to admit I made mistakes, but I paid for those mistakes by getting the sack. My wife and myself being on the dole for four months was enough to take. "I have been back three times since getting the sack and on all three I have been verbally abused. I am telling you now that in my opinion Blackpool's support is the poorest I've known in 23 years in football. "It's not just sour grapes because we lost the game, I can take that sort of abuse, but when I went out to inspect the pitch at 1:45 I was verbally abused by three or four stewards and they are employees of Blackpool Football Club. I had to endure that." Mr Mullen concluded by saying: "No matter what problems I had during my time at Blackpool I can always say that I tried my best." Mr Mullen was raring to go a week on. We were still in the FA Cup because of the fog at Derby and we would now replay the game on 4th round day a week after this Gillingham game. Adrian Randall was available again having had to sit out the cup game at Derby because of him being cup tied, but again he had to settle for a place on the bench on his return. There were two changes from the team beaten at Blackpool. Mark Kendall had a nightmare at Bloomfield Road and hardly inspired at Derby. Unable to cope with it, he'd gone back to Swansea which meant another recall for Chris Pearce in goal. Graham Lancashire also came in for the injured Roger Eli. It proved to be Mike Conroy's day as he became the third Burnley player to score a hat trick in the season. 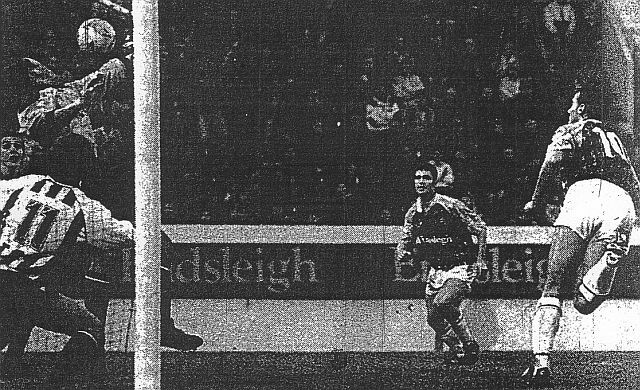 Roger Eli hit all three in the 3-0 home win against Chesterfield, although to this day the third one is disputed by John Francis, and Graham Lancashire had netted three of the goals in the 6-2 win at Wrexham that finally landed Mullen the job. Conroy had a strange sort of day. He scored one in the first half but missed two glorious chances that looked as though they could prove costly when Gillingham came back to equalise, but it all came good in the second half with him completing the hat trick on the day that Randall, on as a substitute, scored his first Burnley goal. During a frustrating first half, Conroy hit the bar from six yards, headed wide from the same position and shot wide when he just had the goalkeeper to beat. Steve Davis also got in on the act with a header against the bar when he should have scored and Lancashire also drove wide when it looked easier to find the target. Burnley got off to the best of starts with an early goal. Davis played a ball down the right hand side. Out came Gills goalkeeper Harvey Lim but under pressure from Steve Harper and Francis he gave the ball away to Andy Farrell who drove a shot towards the empty net. It was going wide but CONROY was there to turn it in and embarrass Lim who certainly wouldn't be going wandering again. That should have been the cue for Burnley to go on and take the game away from Gillingham but the catalogue of missed chances in front of the cricket field end were looking costly when Gillingham, who had offered precious little, equalised from their first corner with around 20 minutes gone. It was a right mess of a goal. Farrell headed the corner but when it came back Conroy headed it straight up in the air before Pearce could do no more than punch it straight to Alan WALKER who slotted home from close range. It was proving to be a frustrating afternoon for Burnley and at half time the score was still 1-1 with Conroy's shot onto the bar the worst miss of the lot. Referee Keith Hackett added on a considerable amount of time after six players, three from each team, required treatment for head injuries in various incidents. Mullen made a change early in the second half, introducing Randall for Farrell, and it wasn't long before the game went very much in our favour. It all started when Davis headed against the bar with the visitors scrambling it away for a corner. Jakub's corner was headed on by John Pender for CONROY who coolly headed home for his and Burnley's second. We were back in front and this time we weren't going to let the lead go. Within a minute of the goal came another. Defender Paul Clarke made a mess of a back pass and Randall nipped in to get the ball. He took it along the line and then laid it back for Francis. Francis got his shot awfully wrong. It was going some distance wide of the target, but it proved to be a perfect return pass for RANDALL who was by the post to turn it home. At 3-1 it was game over and to put the icing on the cake, we got the fourth and the hat trick goal. Conroy played a cross field ball for Harper who tore up the left wing before laying the ball back to Jakub. The left back's ball found CONROY on the edge of the area. He took the ball on his chest , burst forward and powered a left footer home to complete the scoring. A 4-1 win and there was even better news to come with Rotherham United holding Mansfield Town to a 1-1 draw at Millmoor, thus allowing us to return to the top of the league. 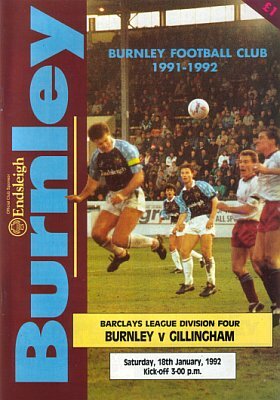 Burnley: Chris Pearce, Ian Measham, Joe Jakub, Steve Davis, John Pender, Andy Farrell (Adrian Randall 50), Steve Harper, John Deary, John Francis, Mike Conroy, Graham Lancashire (Mark Yates 86). Gillingham: Harvey Lim, Tim O'Shea, Elliot Martin, Neil Smith, Alan Walker (Brian Clarke 79), Mark Dempsey, Paul Clark, David Crown (Austin Berkley 68), Karl Elsey, Steve Lovell, Mark O'Connor. Harvey Lim became something of a cult figure with Burnley fans and we've been able to trace him through a member of the message board (streeterpingfellow). At the end of his football career in England he moved to Hong Kong and then to Whistler in Canada where he now owns an art gallery and framing studio called Art Junction. Lim said: “When I finished up playing I did a bit of travelling and came out to Ontario, I got hooked on skiing and in the summer it's huge on mountain biking and rock climbing here, so that replaced my fix for football. Despite finding other passions to replace his thirst for football, Lim still finds time to play at an amateur level, albeit outfield. “There are a couple of leagues in Whistler, we have a summer league and I play in that, I still get pressured into playing in goal sometimes but most of the time I play outfield." 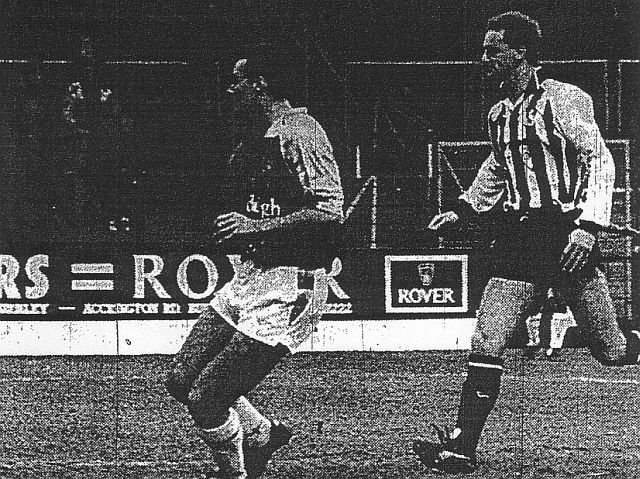 News of scores from other grounds wasn't as easy to obtain twenty years ago as it is today but at half time we were dropping another two points on Mansfield who were a goal to the good at Rotherham . Thankfully Des Hazell equalised for Rotherham in the second half as the Clarets went on to win. Scunthorpe United, now seventh in the table also, like Burnley, won 4-1 with Jason White getting a hat trick. On the subject of goals; Burnley's fourth was our 50th league goal of the season. The night before Barnet also reached that total as did Blackpool on the Saturday with their second, and winning goal at Hereford United.